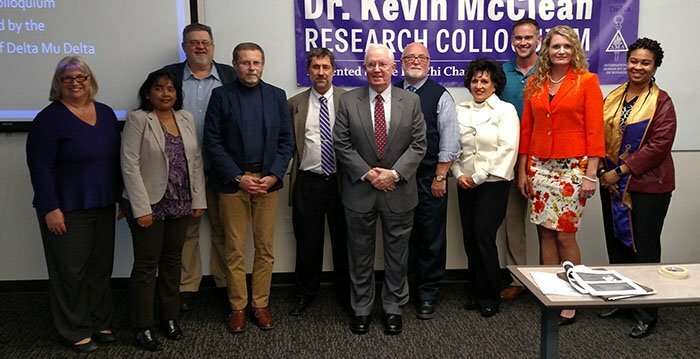 Key figures at the first annual Dr. Kevin McClean Research Colloquium included (from left) Dr. Donna DeMilia, Dr. Daisy Savarirajan, Chip Lamca, Dr. Isac Artzi, Dr. James Helfers, McClean, Dr. Timothy Larkin, Dr. Marjaneh Gilpatrick, Dr. Ed Slover, Professor Tracy Vasquez and Dr. Moronke Oke. Dr. Kevin McClean loved being at Grand Canyon University. He got to campus around 7 a.m. every day. He helped organize student activities, including an annual research colloquium. If there was a major event in the evening – he especially enjoyed basketball games – he would be there. Even lunchtime was a labor of love – and purpose. The popular Colangelo College of Business (CCOB) professor retired in 2016, but his dedication is still being felt. 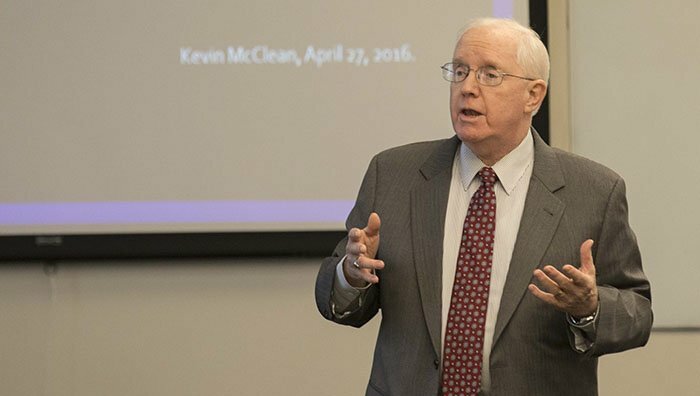 And now his legacy is preserved in an annual event – he was the guest of honor Wednesday afternoon at the first annual Dr. Kevin McClean Research Colloquium. It was easy to see why the Eta Chi chapter of Delta Mu Delta, the international honor society in business, wanted to name its event for McClean. 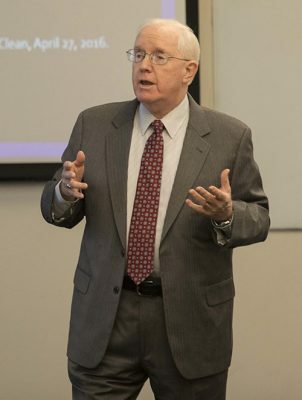 His first colloquium, in 2008, came right around the time GCU President Brian Mueller arrived at the University, and Mueller quickly saw why McClean had won GCU’s “CEO Award” the year before. That was evident when McClean held his first colloquium in 2008. “We wanted this just to be a platform to get people interested and to get researchers to feel that they had a place to expose what they were doing,” he said. It grew over time, and Wednesday’s presentations featured research that shows how much the University has accomplished in the last 10 years. “How do you make sense out of our views of the world?” wondered Helfers, a professor in the College of Humanities and Social Sciences (CHSS). One way is through medieval travelers’ descriptions and interpretations of landscapes. Mappa Mundi (global maps) and narrative descriptions of Holy Land sites during the Middle Ages are structured by a religious perspective and allegory. The two College of Education adjunct faculty members injected team teaching into their approach and found that it was effective when it used known best practices. It was particularly important, they found, to include reflection time for both themselves and students. The College of Theology professor is a board member of Vine and Branches Global Ministries, which leads mission trips to Peru. He makes about five trips a year himself. The experience has taught him that being a missionary also means having to be good at business, and his research offers models for alternative funding besides donations. The emerging problem of antibiotic resistance of microbial pathogens has led to the search for novel antimicrobial alternatives. Historically, medicinal plants are a good source of antimicrobials. The two College of Science, Engineering, and Technology professors reported the antimicrobial efficacy of diverse plants indigenous to the Sonoran Desert in Arizona. Future students might be learning through mixed reality devices such as the Microsoft HoloLens, which combines virtual reality, augmented reality and interaction with real objects. Artzi, the Program Lead for Computer Science, said it would be possible to teach by creating 3D graphics objects that interact with the environment. In a study of 1,276 students in an undergraduate business program, the Assistant Professor of Management and Marketing found that traditional-age students performed similarly no matter whether they took the class on campus or online. But non-traditional age students who took the class online scored significantly higher than those who took it on campus. The CHSS professor studied the wide variety of undergraduates, both sociology and non-sociology majors, taking Introduction to Sociology courses. His goal was to help students with the engagement of multiple disciplines and by sharing classroom techniques for sociology skill-building. Dr. Moronke Oke and Dr. Donna DeMilia, the CCOB professors who serve as Delta Mu Delta faculty advisors, had to choose from 15 submitted presentations. 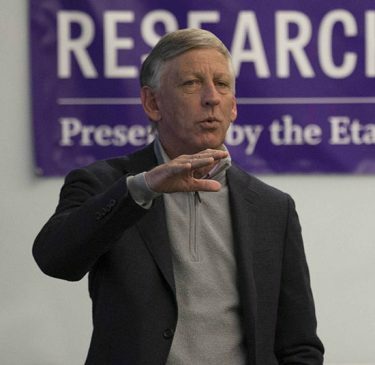 And GCU’s research program figures to grow even more if the University’s return to non-profit status is approved by the Higher Learning Commission – it would open the door to grants not currently available to GCU because of its current for-profit status. That excites McClean, a New York native who traveled all the way from his home on Long Island to be at the event. He still serves as an adjunct business professor and senior doctoral chair (“It keeps me occupied,” he said), and having the colloquium named for him is yet another way to stay connected. But he also wants the event to be an important part of the spring semester schedule. Just as all that interaction with students was the right thing. But it also gave him joy. “I like the place. I was blessed – blessed to wind up here,” he said. The blessing goes two ways. It doesn’t take much research to figure that out.